I love creating photoshoots. There, I said it. I love crafting a theme, visualizing the end product, scheduling the shoot, lining up talent (models and hair), pulling pieces for fashion styling from retailers and designers, doing make-up on the models, styling ensembles, doing interesting things with accessories, photographing the models, bringing out the best in everyone and bouncing ideas off one another during the shoot. The latest shoot is for a Holiday Style 4-pg color spread to be published in the December 2012 issue of Little Village Magazine. It is no secret that I am hoping and trying to become the editor of a Style section in the magazine (currently that does not exist and I am editing Food and Dining Culture). I hope to create a "What to Buy- What to Wear- What to Gift" type of Style section. I am appreciative of the local retailer's support in my endeavor (Catherine of Catherine's and Iowa City Pop Up Stores (Merci), Sheila of Revival, Todd of Artifacts, Cortnie of White Rabbit, Codi at Home Ec and Niki at RSVP. The shoot went as smoothly as ever (although we did miss Monica, a model who is a doula and had a client going into labor so she could not participate - ok, fine - a good enough reason) and with the help of my wonderful Personal Assistant (PA), Wendy, the day flew by and we had a wonderful time. 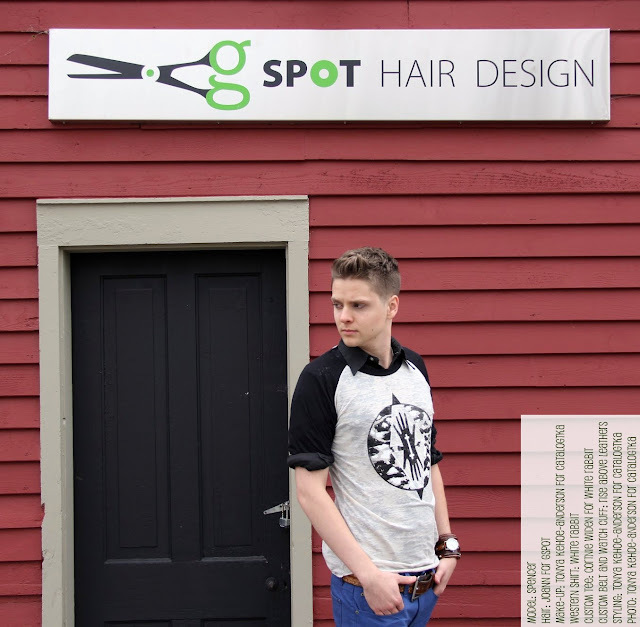 We couldn't have done it as well without the generosity of GSpot Hair Design for allowing us to utilize the salon for prep HQ. I always like to work with my best friend, Heather Atkinson (of Heather Atkinson Art and Feedsack blogs) She makes me laugh, has amazing ideas and takes wonderful photos. We seem to complement each other's abilities and she always makes work like this seem like play. We are a great team. As editing and curating photos for the magazine layout is taking place, we will be posting photos that are not selected for publication to share and enjoy with all of you. Why not?! Lastly, thank you for following catalogTKA and supporting us with your readership, sharing of posts, and thoughtful comments. 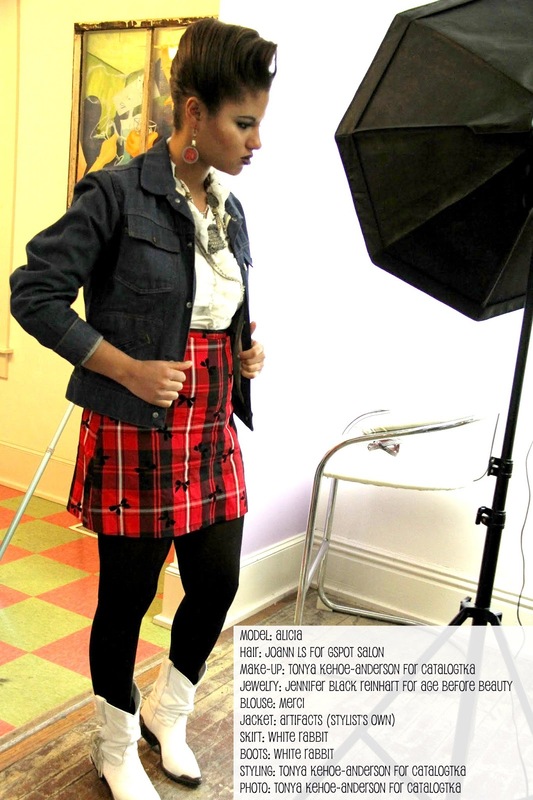 Alica: our classic rock star and Billie Holiday-esque beauty prepares for some close-up shots.